Founded to allow oil producing countries to have more control over the price of oil, and thereby state revenues, OPEC has grown into an institution that controls two-thirds of the world’s oil reserves and generates roughly half of the world’s oil exports. The creation of OPEC was a major blow to the control of the global oil market by the Western giants like Exxon and British Petroleum. While OPEC does include non-Middle Eastern countries such as Venezuela, Indonesia and Nigeria, it is heavily dominated by countries from that region. As a result, OPEC has intervened in the political crises there. Most famously, OPEC refused oil exports to Western countries supporting Israel in the Yom Kippur (or October) War. This resulted in a 400% increase in oil prices and required rationing in the West. OPEC is a bit like an extra Middle East scoring card, except only for you. It is up to you how many countries you need in order to trigger OPEC: I have done it for 1 VP, but usually I probably wouldn’t usually trigger it once it is 2 or fewer VPs. Normally this ends up being around 4-5 VPs; I often hold onto it to see if I can extract some extra value out of it. OPEC really is like an extra Middle East scoring card, but unlike a Middle East scoring card, it has 3 Ops and therefore can be spaced. And indeed, I usually do space it, since it is a rare game indeed where this isn’t scoring 3+ VPs. Alternatively, you can also use the 3 Ops to try to break control of a USSR country to lower OPEC’s effect. This is like a Special Relationship null play, but carries the disadvantage that you’re probably still giving up some VPs. On Turn 6, this is one of those cards that I make sure to try to hold past the Turn 7 reshuffle before discarding, since this is particularly bad time to be handing the USSR an extra 4-5 VPs. Incidentally, any time you see the USSR play into Gulf States, you should be on alert that OPEC is coming. This entry was posted in Mid War, USSR Events and tagged opec. Bookmark the permalink. 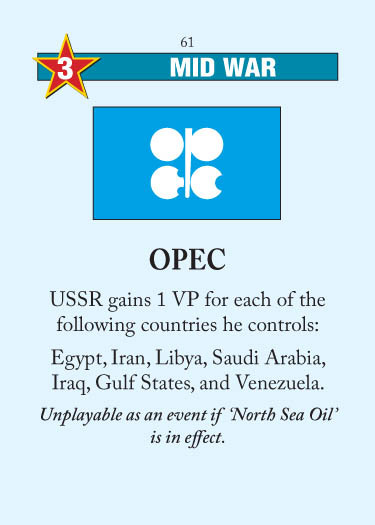 Very true – in fact in a game I am currently playing, my opponent has just played into gulf states and the extra VP which this will afford him will give him the win, meaning that he almost certainly holds opec. I know he also holds a good scoring card of mine, so I’m considering breaking control of a couple of ME battlegrounds for a couple of rounds just to try to survive!